I ask the young park ranger if there are any cabins left. He says no, just the shed. But it’s not just the shed. 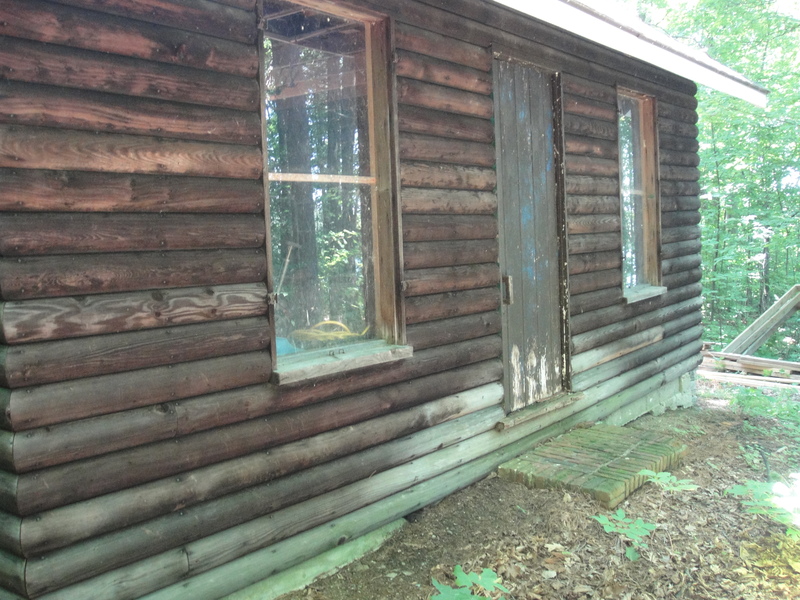 I take some photos of the outside of the cabin and head deeper into the woods toward the Point of Rocks. Something tells me to go back. The cabin is unlocked. Names and dates in uneven scrawl. White paint against dark wood. 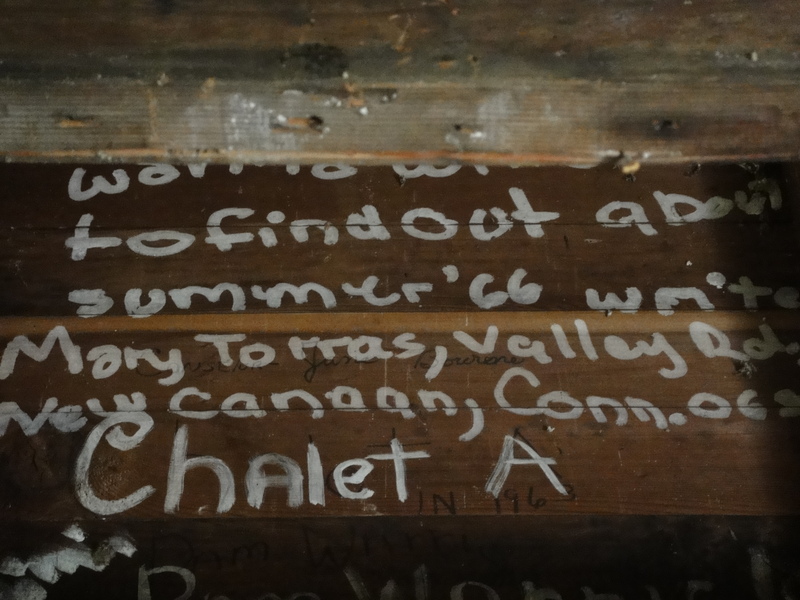 The shed is Chalet A–the insides hollowed out to make room for rakes and saws, park signs and four wheelers. Kim was here. 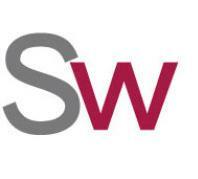 Becky Howe was here. I remember her. Connie Bryan in 1965. 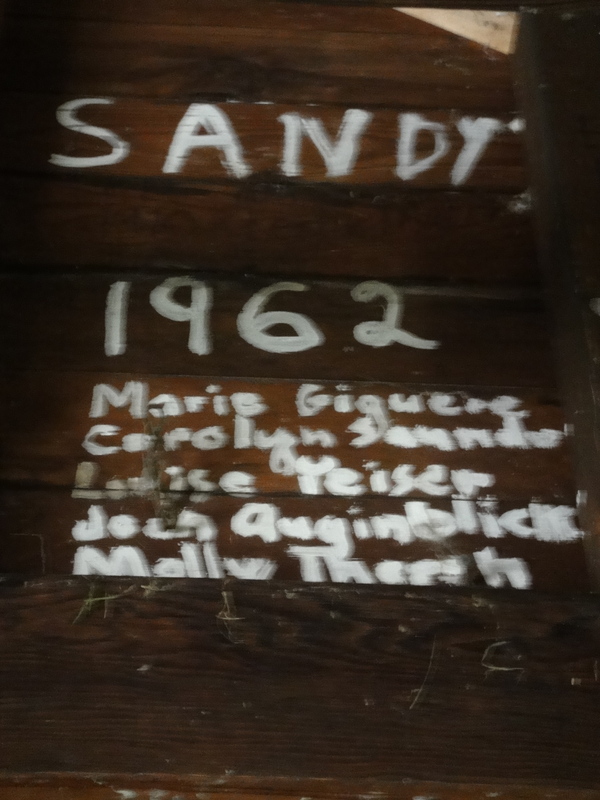 If you want to find out about the summer of ’66, write to Mary Torras, Valley Road, New Canaan, CT. Leslie 1970. Nicole Browning I remember from 1970. 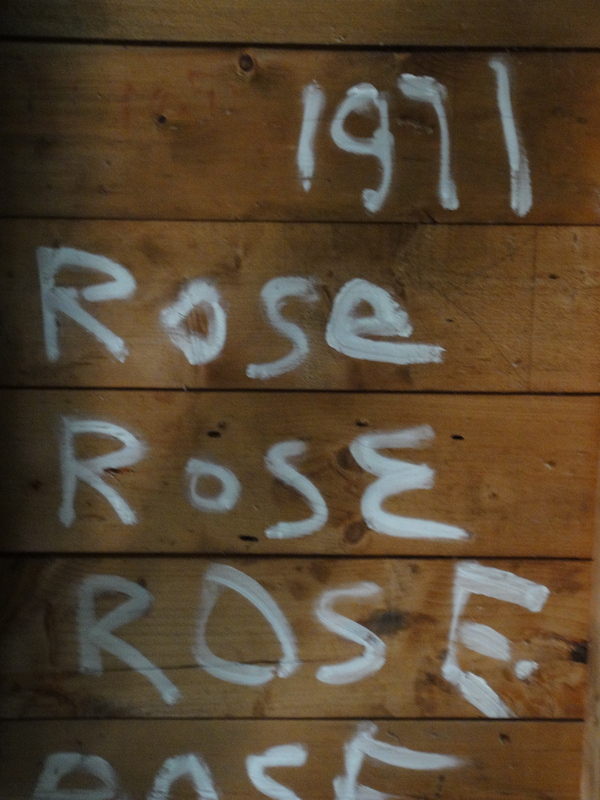 Rose was here in 1971. Sandy in 1962. 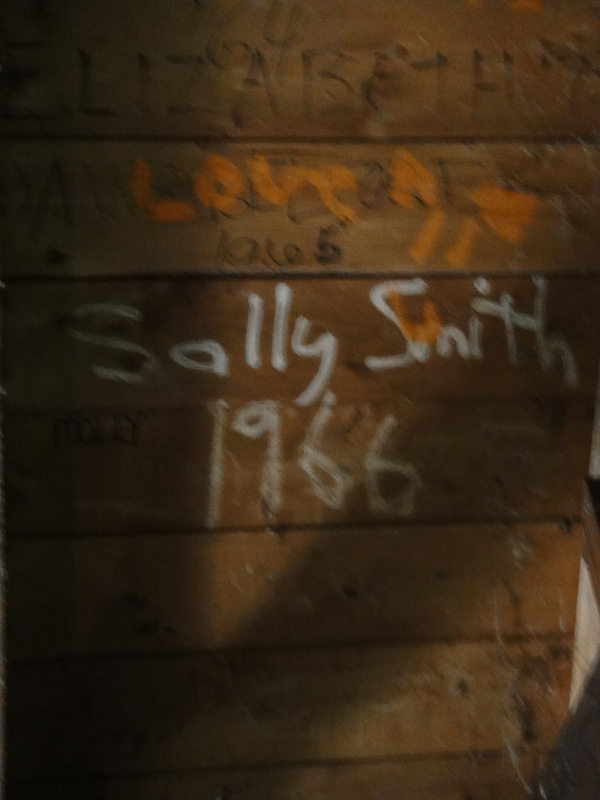 Sally Smith in 1966. Ceci Blewer in ’68. Vee Vee was here. 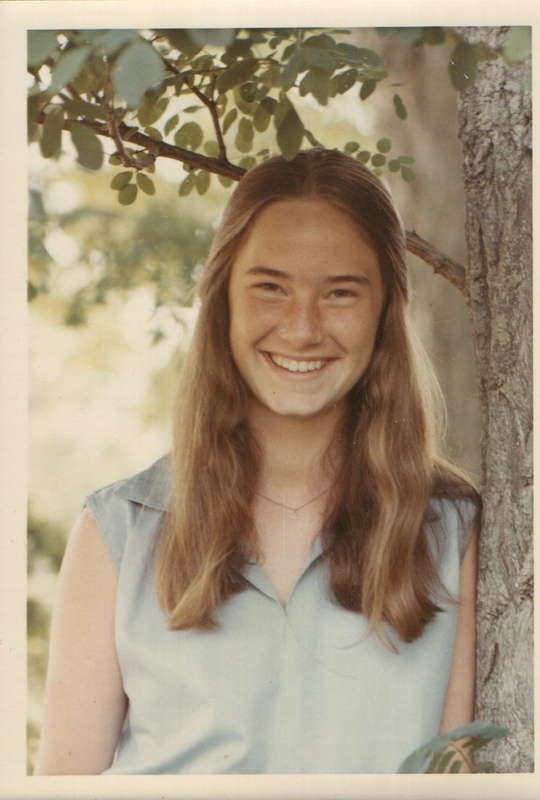 Heather in 1973. This discovery fills a part of the empty box I brought along today, letting me know that part of the reason I return is to find proof that I was in fact here, that what I remember is not just in my head, not just a dream I had, but something I can touch. And here it’s made of paint and wood—words that persist. I am part of this place. This place is part of who I am. I’m beginning to see a pattern. Another place that holds part of me is what used to be my grandparent’s house in Mobile, Alabama. I’ve returned there once as an adult and written this story about it. How wonderful to see those signatures from your past! I loved seeing the photo of you back then – you look so happy. I can see why from your photos of the camp. Sarah, when I walked into that cabin, I felt as if I had struck gold. Those summers at Ecole Champlain were magical. Wow, very cool. The past is still present. Just out of curiosity, what is the camp now? Is it a state park, or? Did you have to get permission to visit via the park ranger? Thanks, Elizabeth. Yes, the past is still present. And the camp is now Kingsland Bay State Park–so no permission necessary. I enjoyed reading your recent blog post on lit-up moments. Beautiful post. What a wonderful tribute to your young self. Young-er self. Young-er. Sorry, it’s late! This shack makes me think that there is a story here. These recent posts of yours are so intriguing. I’m not sure if it’s the mystery of rediscovering one’s past, the wonder of who we used to be, intertwined with who we have become, and who/what was lost in between it all, those years, jobs, classes, loves, loss. So much to think on. Oh, Terresa, I love this comment of yours–you say what it is so well.